In the 16th Century Pope Leo X wanted to build a Basilica to house the bones of the Apostles, but to do so he needed money, and lots of it. So, this Roman Pope hit upon a plan to sell indulgences, or get out of purgatory free certificates, to fund this project. Why does this matter? After all, it’s ancient history, right? 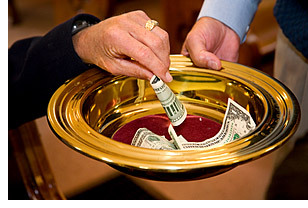 Well, it matters because today we have preachers telling their people that tithing serves a similar purpose, which is getting connected to God’s promises via the “covenant”. Now folks, the reformation was about this problem. How does someone get into God’s kingdom? By purchasing something? By tithing? By giving alms? Or is it by faith apart from works of the law? This IS the Christian difference. By Christ’s shed blood, for me, for you, for everyone who is far off. Anyone who says otherwise is selling you something. Thanks, guys! I've been getting out of your more humorous 'routines'. It's nice to know that can you can share a laugh, yet still provide a gospel message that's relevant. God bless, and keep up the good work! Yeah, we try not to take ourselves too seriously. After all, we're just caught up in God's story, so we're just bit players here.